Key difference: Sugar is the generalized name for sweet-flavored food substances. The sugar we used on a daily basis is often called as table sugar. However, it has another name as well, granulated sugar. This sugar is the most commonly used sugar and is used in most of the recipes. Icing sugar is a super fine sugar, finer than even castor sugar. 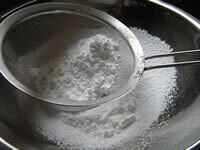 It is often termed as 10X sugar, confectioner's sugar or powdered sugar. Sugar is processed through a long process. First the juice is extracted, and then purified with lime and heat. Then it is further processed, and it eventually separates into sugar crystals and molasses. The sugar crystals are bleached and refined to give the end product, which we buy at the supermarket. This is the traditional white sugar. The sugar we used on a daily basis is often called as table sugar. However, it has another name as well, granulated sugar. This sugar is the most commonly used sugar and is used in most of the recipes. 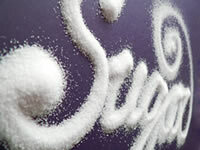 Regular sugar is well recognized due to its paper-white color and fine crystals. They are able to dissolve better when added to recipes or heated. When heated, sugar tends to take on a toffee-like color and flavor, which is why it is also often used in the production of caramel. Table sugar has medium-sized granules, about 0.5 mm across. The medium size of the granules allows the sugar to incorporate more air into the batter, as oppose to most other types of sugar. However, the size of the sugar crystals may vary from difference manufactures. Some may be too fine, while some may be too large. Mixing granulated sugar with sugar syrup and molding them in lumps leads to the production of sugar cubes. Icing sugar is a super fine sugar, finer than even castor sugar. It is often termed as 10X sugar, confectioner's sugar or powdered sugar. The size of the sugar crystal varies 10X sugar is usually 0.010 mm, while confectioner's sugar is 0.060 mm, and icing sugar is 0.024 mm. The term 10X refers to sugar that has been processed ten times. In addition to sugar, most commercially sold icing sugar has an anti-caking agent to prevent clumping of the sugar. This is usually 1% to 3% either cornstarch or tri-calcium phosphate. To get the fine granulation of the icing sugar, the sugar is ground in a steel magnesium rotary which turns against varying degrees of fine screens. Each of these screens determines a different fineness of the grind. The coarser granulation of the initial sugar, the more even will be the final grind. Icing sugar is often used to make icings, frostings, confections, sweet pastry, meringues, whipping cream or for dusting a final touch on cakes, waffles or pastries. This is mainly due to the fact the anti-caking agent in the sugar prevent it from crystallizing. One can also make an adequate substitute for icing sugar at home, by running regular sugar in a food processor until it has turned into a fine powder. In order to make it exactly like the store brought product, i.e. with the anti-caking properties, add 1 teaspoon of cornstarch to 1 cup of powdered sugar.